Mock Rock screw-on holds offer both economy and versatility. They can be readily fixed to timber and other substrates in order to provide interesting and challenging problems for all ages and abilities. You can put them exactly where you want them without having to rely on a pre-placed T-nut (as for bolt-ons), move them and add new ones easily. Screw-on holds offer the potential of a much greater hold density compared with bolt-on holds for the same money. Ideal for footholds, in a traverse wall and really all kinds of problems depending on ability, from novice on a slab to strong, competent climber on a 45 degree overhang. Mock Rock screw-on holds are divided into sets according to size, from tiny foot smears to large positive hand holds. All holds are supplied with appropriate screws. Holdfast screw-on holds are suitable for flat timber or decking and certain sets can be used on flat, sound masonry. Also holds such as XLC, XLD and recently launched XLE have been designed to be very positive but with compact bases making them ideal for trees and pole forests. A further new product is a second series of Macro holds equivalent to large/medium bolt-ons in size. 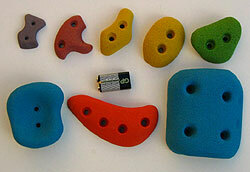 Size of Holds Sets are pictured with a 100mm carabiner. However this does not truly reflect the depth of holds; thus in addition we use an average volume factor (VF) for each set which is taken as unity for SA holds and is roughly equivalent to a 9V alkaline battery. So VF = 1 for SA and, for example, VF = 3 for XLA (ie 3 times bigger).